Field Day is The LP’s annual festival that showcases the rich spectrum of local arts and culture in our three anchor neighborhoods: Bedford-Stuyvesant, Harlem, and Hunts Point / Longwood. The three day festival is open to everyone to participate by collecting a booklet containing a map and complete details on festival activities. 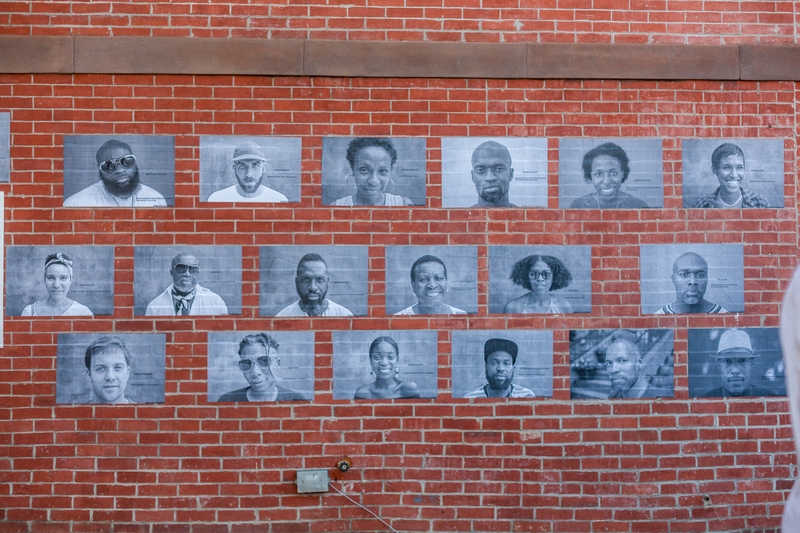 The activities include open studio visits with Create Change Residents and Commissioned artists, free art workshops, public programs led by our Fellows, creative walks and more. Click here to see photos from Field Day. Day one of Field Day 2015 was the perfect start to The Laundromat Project’s three day festival. 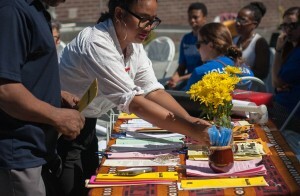 On day two, the festivities moved to the neighborhood of Bedford-Stuyvesant, Brooklyn. Covering five sites for project ‘Imagine Bed-Stuy’, day two entailed lots of walking throughout the 2.8 sq/mi neighborhood with a population of an estimated 160,000 residents. 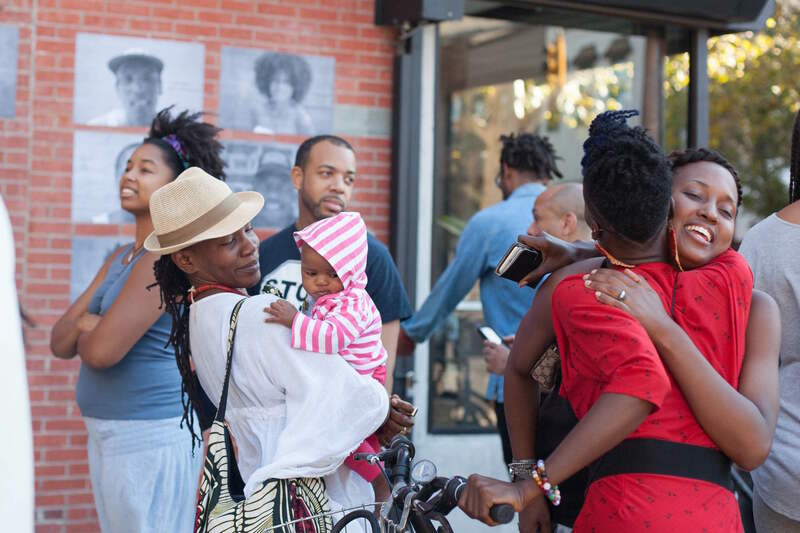 Bed-Stuy is known as the cultural center for African Americans in Brooklyn as African Americans make up 70% of the population. Upon arriving at station one (the Marmy Laundromat located on 197 Malcolm X Blvd), teaching Artist Jasmine Murrell was present once again but this time to help the residents unleash their creative side with print stamp making in a workshop titled “Make Your Mark.” The purpose of this workshop was for the participants to express who they are, what they care about in the form of a symbol. Seven year old Kyesha said, “I made a butterfly for my mom because it’s her favorite and it reminds me of her.” Kyesha, along with her father both created symbolic stamps. [slideshow_deploy id=’5289′] Over at station two (The Luminal Theater located at 405 Tompkins Ave.) fellow Jason Maas hosted a live hybrid of storytelling and portrait drawing in a session titled “Legacy.” We witnessed a Bed-Stuy resident named Arnold enlighten the crowd about his life in the neighborhood. Arnold told the audience, “the parents in the neighborhood felt safe enough where the children could play on the block while the parents stayed inside.” It was interesting to see Jason sketch a very realistic portrait of Arnold as he was in motion. As Jason states, “I start each portrait with the eyes.” As the eyes are the windows into a person’s soul it made all the sense in the world. Upon arriving at station three (Sincerely, Tommy located at 343 Tomkins Ave) Rasu Jilani along with store owner Kai Avent de-Leon had developed a very energetic scene for Rasu’s project titled ‘Griots in ‘The Stuy.’ The online archive of Bed-Stuy residents’ stories and a temporary public art installation of photographs drew a crowd. Seeing some of the residents speak with spectators as their photos were installed on the ‘Sincerely, Tommy’s’ wall was a multi-sensory experience. The project emphasizes on Rasu’s objective of catalyzing an interaction between artists, the local community and the wider public. By doing this he plans to promote awareness around social issues through exhibitions, humanities, community programs and cultural events. 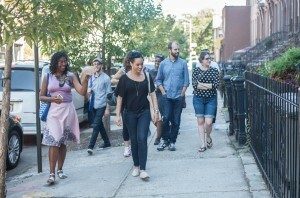 Taking a break from the stations, 2014 Artist-in-Residence Chloë Bass led a creative walk inviting participants to see the neighborhood from the perspective of stray cats titled as “cat walks.” Chloë’s love for cats, especially her own named Tommy, encouraged her to follow the stray cats of Bed-Stuy. The walk took the participants on a journey where she informed them how cats liked to be alone, go to clean and safe places and generally like to inhabit green spaces. The walk later turned into a great social message as she realized that the way people treat stray cats as dangerous is very similar in the way that society treats individuals of low income. It was an eye opener to say the least. Heading on to station four (Bedford-Stuyvesant Restoration Plaza at 1368 Fulton St), there was quite a bit of activity as both poetry and self-defense workshops were taking place concurrently. Led by Francis Estrada and Nicholas Powers, it was an informative sight. Participants sat in a circle and they learned about poetry while pairs lined up on the steps of the Restoration Plaza and practice newly learned self-defense moves. With so much to do in four hours we finally arrived at station five (the Halsey Community Garden at 462 Halsey St). It was where the final part of project ‘Imagine Bed-Stuy’ commenced. There was lots of organic food prepared for all to enjoy. 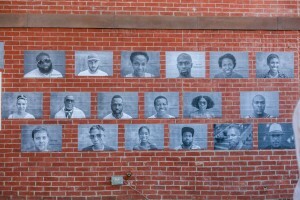 The main objective was to make people aware of the “creativity, beauty, diversity and strength of the Bedford-Stuyvesant community,” as fellow Ola Ronke states. The fellows wanted to focus on organizations that help to make Bed-Stuy the great neighborhood it is and not just what is making it become trendy. “Bridge Street Development Corporation which offers free money management and home buying classes, runs the amazing BedStuy brownstone tour. Brooklyn Movement Center works around food justice and food access, as well as combating police brutality and empowering residents in many other ways. 462 Halsey Community Garden which runs the food box program and offers residents a chance to grow fruits and vegetables as well as order fresh, in-season, farm-grown boxes of produce for only twelve dollars,” said Ola Ronke about the partners. Together with these organizations, the team did an outstanding job of connecting with the Bed-Stuy community while making it a fun experience for all involved. Field Day 2015 in Bedford-Stuyvesant was another great success thanks to the Bed-Stuy community, the fellows (Ola Ronke, Adaku Utah, Hossannah Asuncion and Jason Maas), and The LP’s staff, volunteers, and other members of the family. The eventful day carried on into the evening with a reception at Bed-Vyne Cocktail with lots of Create Change Fellows coming out to support. It was also nice to see ellows from the Hunts Point / Longwood team come out to support the Bed-Stuy group before their own big day in The Bronx.